An important file-sharing prosecution has just taken another unexpected turn. The case, which is notable as the first ever to involve the monitoring and subsequent charging of a BitTorrent user in Sweden, centers around the pre-release leaking of a Beyonce album to The Pirate Bay. Now, in a parallel action brought by Sony Music Entertainment, the labels are seeking eye-watering damages of 1.5 million kronor, a cool $233,000. Sweden has long been associated with the sharing of digital data, a position that was further underlined in the last decade by the creation of Piratbyran and The Pirate Bay. Due to its connections with the world’s largest torrent site, one might expect that prosecutions of Swedish file-sharers would be focused on those using the popular protocol, but that hasn’t been the case. Difficulties with gathering evidence have seen the authorities focus on chasing down individuals using other sharing systems where proving large-scale infringement is much more straightforward. Last year though, all that changed. In a first-of-its-kind case, electronic monitoring and evidence gathering carried out by DtecNet, the U.S. outfit behind the “six-strikes” scheme in the United States, led authorities to prosecute a BitTorrent user of The Pirate Bay. The claim is that on June 8, 2011 a man from Gothenburg shared Beyonce’s album ’4′ in advance of its June 24 commercial release date. The case was made even more interesting following the revelation that the 47-year-old is a music industry worker. The industry claims that pre-release leaks are the most damaging form of piracy, an opinion that judges have agreed with in the past. The end results are often heavy fines and even jail sentences which make these cases particularly useful in sending anti-piracy messages to file-sharers. There are signs are that Swedish authorities and Sony intend to make the very best of this case in that respect. Prosecutor Henrik Rasmusson says that he believes that punishments in this criminal case will be heavy. Last week Sony announced that it would also be seeking damages in a parallel civil case. In a submission to the Gothenburg District Court, Sony said that its business has been negatively affected by the leak on a number of fronts. The label says it has suffered damage to its marketing strategy, sales revenues and has also incurred additional costs. Sony adds that its relationship with Beyonce has been damaged and the artist’s reputation hurt. 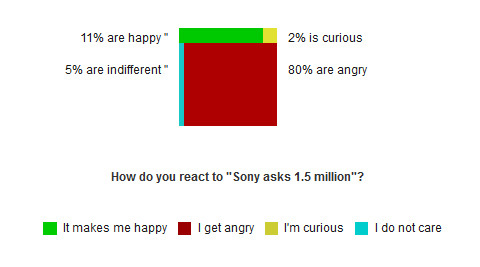 For all of the above Sony say they will claim 1.5 million kronor from the man, which is roughly $233,000. In a comment to Sveriges Radio, Marianne Levin, a professor of civil law at Stockholm University, said that she has doubts that damages can be fairly calculated. Levin said that it is difficult to know exactly how many album sales had been lost to file-sharing. Since the album had not even been released at the time, no comparison with existing sales can be made. “I think so far [the calculations on damages] have not been done in a satisfactory way in situations like this, and the question is whether it will ever be done,” says Levin. “This is a nuisance from a copyright perspective. But it does not mean that you should have some kind of punitive damages to scare people,” she concludes. And the proposed punitive damages aren’t going down well with the public either it seems. A poll of 280 people on news site Sydsvenska Dagbladet received the following response.